Sunny south/east facing Zodiaco style quad house in El Galan. The house comprises 3 bedrooms, 2 bathrooms, living/dining room, kitchen, porch, 2 terraces and a rooftop solarium with storage room and distant sea views. Built on a plot with private swimming pool and terraced areas. The property includes furniture, white goods, air conditioning units, fireplace and fitted wardrobes. Part of a complex with a communal swimming pool and located in a residential area close to the golf courses of Villamartin, Las Ramblas and Campoamor. 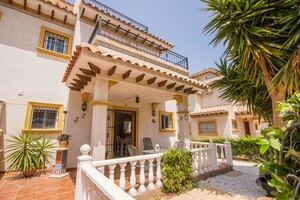 At a 10 minute drive from the beaches of Orihuela Costa.